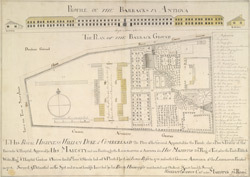 A plan and elevation of the military barracks in Antigua, drawn by Captain William Gordon. The Thirty-eighth Regiment of Foot was deployed to defend Antigua but its men had inadequate provisions and unsuitable accommodation. Improved barracks were finally built at Rat Island’s harbour in the 1740s and further buildings, shown in this plan, were provided for the regiment some ten years later, east of the town of St John’s.